Discover the power of soft with Fairy Non Bio washing capsules. It is no surprise that Fairy Non Bio was voted no.1 brand for sensitive skin. * Fairy Non Bio pods are gentle and wrap your family's delicate skin in huggable softness. It is dermatologically tested and hypoallergenic which makes it the ideal companion for babies' very sensitive skin. 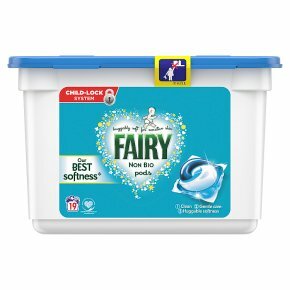 Put delightful Fairy Non Bio softness into the heart of your wash, by simply adding one of our handy washing tablets directly into the drum. Each Liquitab capsule contains the right amount of detergent to leave laundry wonderfully clean and soft next to precious skin. Unlike washing powder, Fairy Non Bio pods have a unique multi-compartment design that keeps the ingredients stable and separate until they reach the wash. Use Fairy Non Bio pods with Fairy Fabric Conditioner for sensitive skins for the softest combination for your baby's skin. 19 washes based on 1 capsule per wash. *Online panel of 3514 females aged 18-55. Voted No.1 Laundry Brand for Sensitive Skin (online panel of 3347 females aged 18-70). Gentle formula. Dermatologically tested. Awarded the Skin Health Alliance Seal. Cleans clothes brilliantly. Huggably soft for sensitive skin.Discover the gentle care of Fairy Non Bio 3in1 PODS. It is no surprise that Fairy Non Bio was voted no.1 brand for sensitive skin. * Fairy Non Bio PODS are gentle and wrap your family's delicate skin in huggable softness. Dermatologically tested, the Fairy Non Bio range has been awarded the Skin Health Alliance seal. Independent tests have confirmed that clothes washed in Fairy are as kind next to skin as clothes washed in water alone. Additionally, they include a special ingredient that will provide delighful softness to your clothes and so they will feel extra gentle on your skin. Unlike washing powder or liquids, Fairy Non Bio pods have a unique multi-compartment design that keeps the ingredients stable and separate until they reach the wash. Each Liquitab capsule contains the right amount of detergent to leave laundry wonderfully clean and soft next to precious skin. For best results, place Fairy Non Bio PODS directly directly into the drum and add your clothes on top. Use Fairy Non Bio pods with Fairy Fabric Conditioner for sensitive skins for the softest combination for your baby's skin. 19 washes based on 1 capsule per wash. *Online panel of 3347 females aged 18-70. Causes serious eye damage. Harmful to aquatic life with long lasting effects. Keep out of reach of children. IF IN EYES: Rinse cautiously with water for several minutes. Remove contact lenses, if present and easy to do. Continue rinsing. IF SWALLOWED: Rinse mouth. Do NOT induce vomiting. Immediately call a POISON CENTER/doctor. Dispose of contents/container to an appropriate local waste system. Please note that no effective laundry detergent can be guaranteed suitable for people with serious skin conditions. If you suffer from unusually sensitive skin, please contact your doctor for advice. Contains MEA-C10-13 Alkyl Benzenesulfonate; MEA-Laureth Sulphate; C12-14 Pareth-7.